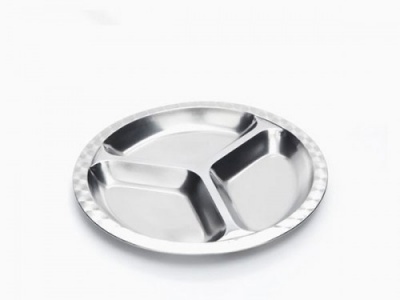 A stainless steel divided food tray. Choose small or medium size. The small measures 22 cm in diameter and the medium measures 24 cm in diameter. Ideal for cold food. Do not use with hot food. Take care with warm food to ensure the steel plate is not too hot before handing to your child. Children love these divided plates. Great for separating dry and wet foods. This can also help with introducing finger foods or for the fussy eater, offering smaller portions, snacks and for sharing. Ideal for cold food. Do not use with hot food. Take care with warm food to ensure the steel plate is not too hot before handing to your child. Available in two sizes - small and medium round. The small round plate measures 22 cm in diameter. 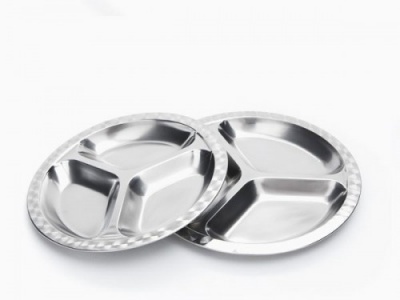 The medium round plate measures 24 cm in diameter.